Right about now, Meiko is on the road—literally—en route from a gig last night at the Majestic Theatre in Madison, Wisconsin to the one she’s playing tomorrow night at the Walnut Room in Denver, Colorado. It’s quite a haul, but she doesn’t seem to mind. “The tour is going awesome,” she says without any trace of artifice or fatigue. “A couple of long drives, but it’s cool.” It’s her first as a headliner, but if the gains she’s made in support of self-titled debut are a portent of what lay ahead, it certainly won’t be her last. Meiko—who was raised in the small town of Roberta, Georgia and currently lives in Los Angeles—has been ambitiously on the rise for the past two years, having independently released her enchanting batch of folk-pop confections in 2007. She subsequently signed with the Myspace/Interscope label, re-issuing Meiko in 2008 with one additional song, “Boys With Girlfriends,” which soon topped the iTunes Singer/Songwriter chart. 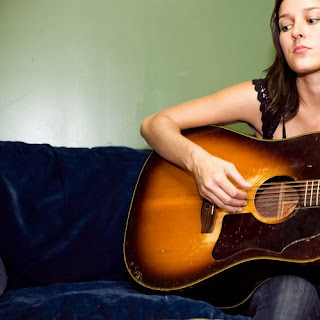 All the while, Meiko paid her dues, opening for the likes of Mat Kearney and Joshua Radin as well as partaking in the ever-popular Hotel Café tour with such artists as Rachael Yamagata, Erin McCarley, and Priscilla Ahn. Most recently, she collaborated with the Crystal Method on “Falling Hard,” the closing track of their latest album, Divided By Night. “It’s been really, really good,” Meiko replies when asked how audiences are responding to her current live shows, but the same could also be said for how her career is progressing. In a conversation with music critic Donald Gibson, she discusses her ongoing evolution as an artist, including where (and from who) she finds inspiration to write as well as what she has planned for the future. When you moved to Los Angeles, was it with the intention of having this career? Not at all. I was in Georgia; I went to college for one semester and I was trying to figure out what I really wanted to do. And I decided to take a break and go hang out in Miami for a little bit with my sister. Then once I got there, she wanted to move to L.A. and I followed her. Do you think living in Georgia, having come from such a small town, affected your songwriting or has an effect on your songwriting? Probably [in] the simplicity of my lyrics. There’s a way I like to write, [of] things that people can relate to and things that I can relate to, usually. So yeah, I would say that probably has something to do with me coming up from a simple town, simple upbringing. I’ve read where you’ve said your songs are autobiographical. When you’re performing them, do you have to revisit the circumstances in which you wrote them? Or can you sing them with conviction regardless? I usually do think about how I felt when I was writing the song. That kind of helps it be not so contrived. But yeah, I do go back there. And I’m not bummed out or anything when I sing them. I’m just remembering how it felt when I was there. One song that really strikes me is “Hiding.” From what I gather in the lyrics, it seems like you’re writing about compensating your own sense of worth, your own sense of who you are, to be with someone else. Is that an accurate description? Not really. I actually wrote that song about my mom. I’d had kind of a strange relationship with her where I really didn’t know how to get in touch with her at a certain point. Originally the lyrics were, “Oh, now, Mama, you…” and I was like, “Well that sounds weird.” So I changed it to “baby.” I’ve actually never told anybody that before. “Under My Bed” seems to be about, after a breakup, all you’re left with are tangible souvenirs. That’s exactly what it was. When I moved to L.A., I moved with my sister, but my boyfriend that I had in Georgia eventually moved to L.A. with us. I ended up breaking up with him, of course, because everybody does that. You go to L.A. with somebody and try to make it work and then break up. And I just remember moving all my stuff out and going through all these things that had kind of morphed into each other, mine and his. I just remember thinking, “Should I take this? Do I want these pictures of me and him?” Of course I took them. And I moved into [my] new place and didn’t really know what to do with them. I put them in a box, stuck them under my bed. Eventually I acquired a few more boxes from a few more relationships. And I haven’t gone through them since. I probably should throw them away at some point. On “Piano Song,” where you sing, “I try so hard not to show this side of me,” are you saying you don’t want to reveal any vulnerability to someone who you may be attracted to? It’s [about] not wanting to reveal to someone how much I miss [him]. I wrote that song when I was waiting for somebody to come back home and I didn’t know when… That’s where the “counting down the hours and counting up the days” [came from]. I didn’t have an exact date…and I didn’t want [him] to know how absolutely dorky I was about [him]. It was a new relationship where I was trying to be the cool one, but totally obsessing behind closed doors. And I wrote that song on piano. I was house sitting for friend[s] and they didn’t have any guitars. I was really inspired to write and I just sat at the piano. That was the first and last piano song that I ever wrote. You haven’t written one since on a piano? No, no. [Laughs] I don’t play piano at all, obviously, with those simple clanking of the keys. But that’s what makes it so endearing. You don’t come off as Rachmaninoff; that’s what makes it appealing to people. Are you working on anything for a subsequent album? I’ve been writing a lot lately. And when I’m not touring, I go back home and kind of get in my studio and record with my friend. We have about six or seven songs recorded. I hope that, by the end of this year, to get in for a good month or so and maybe try to finish up something, either an EP or a record. I’ve been playing a few new songs in my live shows and I’m excited to get them recorded. I think a lot of the true-blue fans are kind of ready for me to hurry up and put something out. How do you measure your progress as a songwriter? I look at the different topics that I write about. It’s not like I try to write about different things, but when I do write a song that’s not just about being pissed off at some guy or some guy’s girlfriend, I know that I’m kind of moving on to a different level. And I also look at the way I play guitar. Because there’s a hole you can get stuck in, playing the same kind of rhythm or playing the same kind of chords. Expanding my knowledge and trying to learn—and trying to learn other ways of playing guitar—is another part of it. When I was little, when I’d just started playing guitar, I would learn a couple of chords and I would just write. I would instantly write a song. And then I’d learn a new chord and I’d write with all those chords. And then I got to the point where I knew, pretty much, all the guitar chords that I felt like I needed to play. Now I try to learn something else because usually that inspires me to write something new. So you’re still trying to expand your knowledge. Oh, yeah. Even getting a new guitar will [inspire] me. I went to Spain for New Year’s and I got a Flamenco guitar. So then I started playing a lot, picking a lot, finding different picking styles. How did the track you have on the new Crystal Method album come about? Yeah, they gave me a couple of songs without words or anything and I really liked that one; it was the slowest one. You mentioned on your blog once that, while you were waiting in line at a store, a girl’s cell phone rang with your song, “Boys With Girlfriends,” as its ringtone. That had to have been surreal. It was. A lot of weird emotions were happening. I was really excited and I wanted to be like, “That’s my song!” but then I was also totally embarrassed at the same time. I just kind of…giggled about it. That’s a lot better than hearing your music in an elevator. Yeah, totally. [Laughs] Or an Applebee’s. For more information, including upcoming tour dates, visit Meiko's Myspace page.